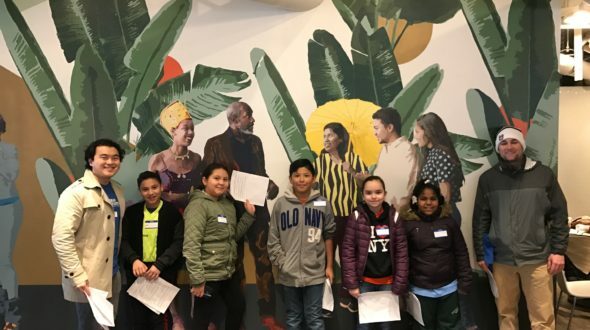 On Saturday, March 25th Urban Initiatives’ Associate Board and UI students from Daley, Lorca, and Walsh went on a Field Trip to Navy Pier! 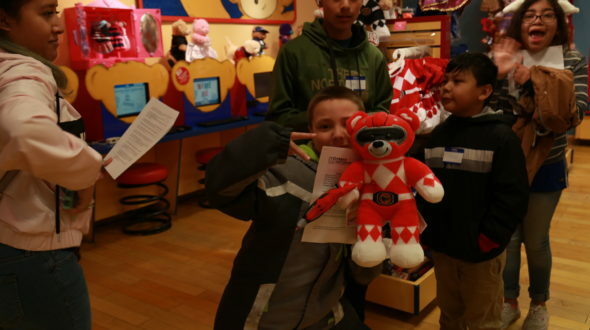 This cultural experience allowed everyone to discover a new and fun place in Chicago! Associate Board members Derek Skoog and Sarah Lewis share the fun below, enjoy. “What is better than spending a rainy Saturday morning at Navy Pier? Spending a rainy Saturday morning at Navy Pier with 100+ UI kids, running around searching for pigs and chicken faces, and trying not to lose anyone amidst all the fun! 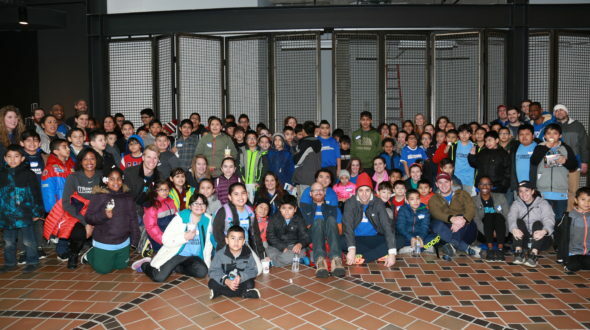 The UI Associate Board had the opportunity to spend Saturday at Navy Pier with kids from Little Village Academy, Walsh, and Daley schools. For entertainment, the kids were split up into teams (ours was named the Cougars!) to compete in a scavenger hunt. 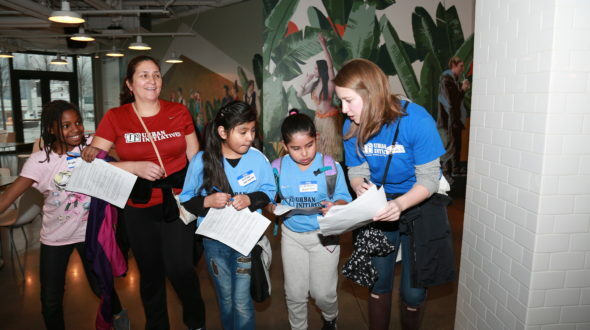 The kids took turns reading clues and leading their teams to the answers, several of which required a team photo, and one which required crafting a 20 second jingle. As teams finished the scavenger hunt (and after a couple of hours of hoping the weather would dissipate), Mother Nature graciously stopped the rain just in time for the teams to ride the new Ferris Wheel. The kids, pumped and thankful that their moms who were afraid of heights weren’t there to stop them from going 200 feet up, lined up anxiously for their turn! After two loops around, trying to spot the city through the thick fog, we rushed back inside for pizza and chit-chatting before the kids packed up and headed home on their busses (reminding us that the Bus Campaign is right around the corner). Going somewhere like Navy Pier is something a lot of the Associate Board may have taken for granted before Saturday. When you see how excited the kids are and hear them talk about how their families would be so jealous, you quickly remember that many of these kids do not have access to other Chicago neighborhoods like we do. 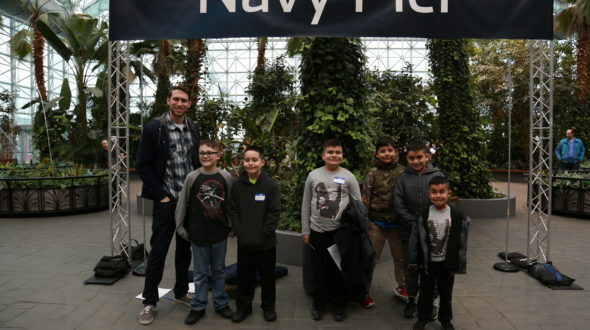 This field trip at Navy Pier gave many of the kids the opportunity to get out of their neighborhood and go up to heights they had never seen before. As for the Associate Board members, the trip gave us the opportunity to build relationships with the kids off of the field, while learning how to keep track of 10 kids at once (thank you parents and teachers for the help!). Urban Initiatives would like to thank Navy Pier for donating 100 free rides to the new Ferris Wheel, giving UI students and their families some amazing views of Chicago!